Australia imports many vehicles from Thailand, and the Thai built cars are thought of very highly down-under. So much so that GoAuto, one of the Australian magazines reported last week that although most Australians regard Thailand as a destination for cheap holidays and spicy food, their Asian neighbour is now growing into a regional automotive superpower. Australian manufacturers are coming under pressure from cheap products imported from Thailand without the usual duty thanks to a free-trade agreement (FTA) struck in 2005. Sometimes, the Australian car-makers come under pressure from the Thai divisions of their own global organisation. Toyota Australia is locked in negotiations to build the next generation Kluger and must beat Toyota Thailand to win the project. Ford Australia has just binned its Focus production plan because it can’t compete with a ‘low-cost source’ in Asia. It won’t name the production location, but it is most likely Ford’s plant in Thailand which will begin producing the Fiesta at the end of this year. With minimal shipping costs, low labour costs and zero import duty, it comes as no surprise that imports of Thai-made vehicles to Australia have almost doubled since 2005. In that year, 84,831 Thai-built cars were sold in Australia, compared with 78,719 vehicles from South Korea. In 2008, Australians bought 154,607 Thai-made cars and 96,437 cars made in South Korea. Thailand has picked a winner by producing mainly commercial vehicles. All of the top-selling ladder-frame work pick-ups, including the Toyota Hilux, most Nissan Navaras, the Holden Colorado, Isuzu D-Max, Ford Ranger and Mazda BT-50, come from the Kingdom. Thai operations also make most of the high-volume vehicles in Honda’s Australia range, while other brands are planning to source cars from there in future. GoAuto understands that Toyota Australia is set to take the next-generation Yaris light car from Thailand and Nissan could take the new Micra from there in 2010. Honda is also looking to use a new free-trade agreement with India to source cheaper steel and some components from the emerging economy to drive down production costs in Thailand even further. With Thai imports to Australia increasing dramatically, it is worthwhile looking at how many cars Australia has exported to Thailand in the last few years. Unfortunately, that number is zero. Ford Australia looked at taking advantage of the new free-trade agreement to export the Territory, while Holden investigated shipping some Commodores, but the Thai government legislated for a 50 percent excise on cars with an engine size of 3.0 litres or more, pricing them out of the market. A new opportunity may arise from 2011 with Ford introducing a 2.0 litre Falcon that would dodge that tax. While Ford Australia said it didn’t make the decision to offer a four-cylinder Falcon based on any increased export potential, it wouldn’t hurt to add some extra volume and send something to Thailand for a change. Last week I asked an easy one - where were the window winders situated on the Mercedes-Benz 300 SL Gullwing? The answer was simply that there weren’t any! The Gullwing’s windows could not be lowered! So to this week. The Issigonis Mini is usually thought of as the first transverse engined car, but it wasn’t. What was the first? Is there anybody left in the world that does not know that seven times World Champion Michael Schumacher is returning to F1? Even my dear old mother who is 92 years of age was on the phone to tell me! Word from Spain is indicating that all tickets have already been sold for the dreadfully boring Valencia race track. Schumacher has that kind of drawing power. Unfortunately for Felipe Massa, his freak accident in Hungary has had the even freakier result that the F1 circus has managed to get its act together, and we, the spectators will be the beneficiaries. 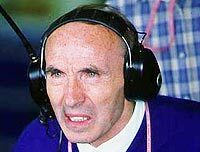 Well, when I say “get its act together”, that’s not quite right, as Sir Frank Williams has shown himself to be the same old Frank Williams, possibly the meanest man on pit lane. Frank (or “Sir” Frank these days) is the team owner of Williams F1 who axed Damon Hill, after Damon became World Champion, and has a history of dropping drivers as soon as an increase in salary is mentioned. But back to Frank’s latest piece of “Bah and Humbuggery”. With the FIA’s totally ridiculous ban on all in-season testing, Ferrari asked the other teams if they would allow Schumacher to have one day behind the wheel of the latest F1 Ferrari. With Schumacher not having raced since 2006, this was to familiarize himself with the latest car, not to test new components. Most of the teams said “Yes!” but Sir Frank, who tried to make an association between the new recruit Alguersuari who entered F1 at Hungary and Schumacher said No! Here is Frank’s justification for his veto. “While we welcome Michael Schumacher back to Formula 1, the fact is that any form of in-season circuit testing is strictly prohibited; a regulation clearly laid out by the FIA and adhered to by all of the teams,” said team boss Frank Williams. “It was for this reason that Alguersuari, who drove an F1 car for the very first time in Hungary, did not have the opportunity to familiarize himself with the Toro Rosso before he made his race debut. “Williams sees no distinction between Alguersuari’s situation and Schumacher’s and feels that any deviation from the rule would create a precedent for the future. Now here is the real situation. Alguersuari is a current race driver, racing every weekend. He had done straight line testing for Torro Rosso in the new car and was familiar with the controls of the 2009 race car. Schumacher is not a current race driver and is yet to familiarize himself with the controls. And finally, Alguersuari will bring his immediate family and a few friends to watch the race at Valencia - Michael Schumacher will bring thousands to the meeting and millions in front of the TV. But no, Frank tries to take the moral high road and at the same time tell Ferrari who they should have in their cars. A pathetic response to the best news in F1 all year! Interestingly, it came out after Frank’s outburst that a request had been put in to let Alguersuari familiarize himself before Hungary, but that request was rejected apparently by the FIA, and not the teams, according to Norbert Haug of McLaren-Mercedes. Despite lagging behind the other two major manufacturers of hybrid vehicles in Japan, it looks as though Nissan will be the first to get an electric car into the mass market, with its oddly named Nissan Leaf. Launched as promised in Japan at the beginning of August, the Leaf is expected to become the world’s first volume-selling all-electric vehicle when it goes on sale globally in 2010. Nissan says it seats five adults in comfort and has a real-world driving range of up to 160 km. The production-ready Leaf marks a significant new direction from Toyota’s hybrid Prius, as well as General Motors’ Volt, which is also due on sale in the US in late 2010. While the Volt features plug-in recharging technology, it is effectively a petrol-electric hybrid like the Prius, which has a token EV-only driving range and relies primarily on its battery-assisted petrol engine. Described by GM as a range-extending EV, the Volt is driven exclusively by battery power, but incorporates a conventional CO2-emitting internal combustion to recharge its battery. Like the Leaf, the Volt has a claimed EV-only range of 160km. Nissan is claiming that the Leaf would come to market with a price that is competitive with a well-equipped C-segment (small) vehicle, making it significantly cheaper than both the similarly-sized Prius and (four-seat) Volt five-door hatchbacks. However, that price doesn’t include the battery (there’s always a catch, isn’t there) which Nissan proposes will be leased to customers and has an anticipated life of just five years - less if it is not maintained at near full capacity (above 80 percent) during that period. 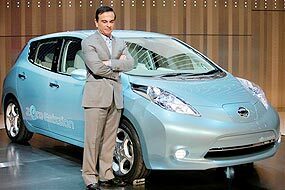 Despite this, Nissan president and CEO Carlos Ghosn says the Leaf will be more affordable to own that an equivalent internal combustion vehicle, because the power that is required to recharge it will cost less than the petrol to fuel a conventional small car. The Leaf’s 48-module Li-Ion battery pack is integrated into the vehicle’s floorpan (in this case under it, in a separate frame), which Nissan says avoids cabin intrusion by the battery and reduces drag by contributing to smoother under-floor air-flow. The battery generates a power output of more than 90 kW, and the electric motor is rated at a competitive 80 kW/280 Nm. Nissan says the Leaf can be charged from empty to 80 percent of its full capacity in less than 30 minutes with a 50 kW “quick charger” or in less than eight hours at home using a 200 volt AC charger. That should be enough charge for 100 km of travel, which Nissan claims is enough to satisfy the requirements of most (presumably urban) drivers. According to Nissan, research shows the car’s total range of 160 km meets the daily driving requirements of more than 70 percent of the world’s consumers who drive cars.